In the leaf, nature has achieved a great feat of technology. It has succeeded in doing what scientists, with all their sophisticated tools, have been trying to do for decades: using light to drive the splitting of water into its component parts to make a fuel. A conceptually simple idea, perhaps, but one that has taken up whole careers and absorbed billions of dollars of research funding. The ultimate goal, of course, is to make use of the abundant energy source that is our sun to power the planet, helping us kick our carbon habit in the process. It’s worth remembering that if only a thousandth of the solar energy that reaches the Earth could be utilised, we would still have nine times the amount of energy we needed.1 And if the sun’s energy could be used to split water, we would have hydrogen and oxygen, renewable fuels which could be recombined in a fuel cell - even in the dark, or on a cloudy day - to give us electricity. It’s not that we don’t have the capability - you could fix a photovoltaic cell onto an electrolyser and have your water splitting device up-and-running tomorrow - it’s that to be commercially viable, any such system would not only have to work efficiently, but would need to be made from cheap materials and run for years. Finding those materials is easier said than done. More than a decade ago, John Turner and Oscar Khaselev at the US National Renewable Energy Laboratory in Golden, Colorado, created a water splitting device by combining photovoltaic and photoelectrochemical technology.2 It did the job, producing hydrogen four times more efficiently than photosynthesis. 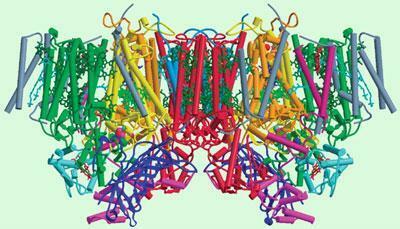 Unlike photosynthesis, however, their system used rare metals and wasn’t stable even for a day. ’What’s happened since then?’ muses Turner. ’In my view, very little has happened since then. There’s been a lot of research, a lot of rhetoric, a lot of hype, but in terms of actual scientific advancement, very little.’ The challenge, however, remains. If you were thinking about trying to do artificial photosynthesis, your first port of call would be natural photosynthesis, right? Why not look at what the leaf does and try to replicate it? But according to David Britt of the University of California, Davis, US, even our understanding of natural photosynthesis is sketchy. Britt’s team uses electron paramagnetic resonance (EPR) spectroscopy to explore the inner structures of biological systems. His current focus is the oxygen evolving complex (OEC) - the active site of the enzyme complex known as photosystem II, which catalyses water oxidation in plants. Previously, x-ray crystallography techniques have been used to study the OEC. But the trouble with x-rays is that they generate photoelectrons that alter the structure of the photosystem, leading some scientists to contest the accuracy of the existing crystal structures. Spectroscopies, explains Britt, are less damaging and can help probe the intermediate oxidation states of the complex. Unfortunately, nature has a couple of billion years’ worth of evolution on us - and, as far as we know, has only come up with one solution. ’Unless we find some bug somewhere that we don’t know about yet, everything uses the same tetranuclear, manganese-calcium complex to do this water splitting reaction,’ he says. Since nature’s blueprint remains, for the moment, under wraps, scientists developing water splitting systems have had to come up with their own designs. And the oxygen evolving part is, of course, only half the equation; there’s also the hydrogen to contend with. At a deeper level, this involves trying to choreograph the movements of a cast of electrons as they flit between the water molecule and its constituent elements - two oxygen ions need to lose four excess electrons to form molecular dioxygen, while the corresponding four hydrogen ions need an extra electron each to form two molecules of dihydrogen. 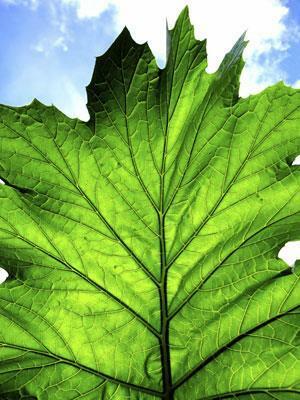 To drive this reaction, researchers must first find a semiconducting material that can effectively capture the sun’s energy, as chlorophyll does in plants. According to Turner, this materials search is what’s really holding up progress. Turner and Khaselev’s early water splitting device used gallium arsenide and gallium indium phosphide as semiconducting materials. Hydrogen formed on the gallium indium phosphide, while the device used a platinum electrode to rip out the oxygen. The problem was that the semiconductors degraded far too quickly in solution. Turner says any future device will have to use materials very similar to those in current solar cells - as a bonus, the hunt for the ideal water splitting material could also throw up a better solar cell material. At Pennsylvania State University, US, a group led by Tom Mallouk is trying a different approach to doing what chlorophyll does - a molecular approach based on dye-sensitised solar cells. 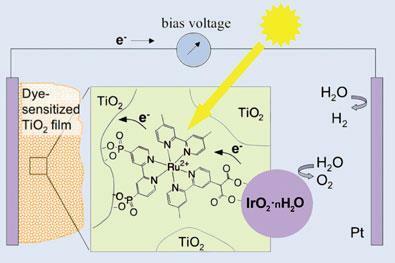 In ordinary dye-sensitised solar cells, which are already commercialised, dye molecules capture visible light and the cell converts it into electricity. The dye molecules turn over billions of times and remain stable for years. 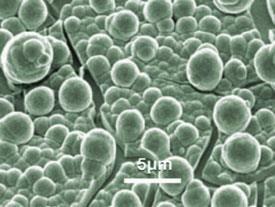 If some of the same principles could be applied to artificial photosynthesis, we might have a practical device. Source: © CHEM. SOC. REV. Mallouk admits his own system, which uses a ruthenium-based dye,4 is still ’pathologically poor’ in terms of turnover. The system uses the dye as a molecular bridge, which absorbs light energy to help pump electrons from hydrated iridium oxide - a known water oxidation catalyst - to a titanium dioxide film. This film forms the anode, which is wired to a platinum cathode, where the hydrogen forms. Despite the low turnover, with the general scheme in place, the electron transfer rates should be tunable, says Mallouk. Although the exact mechanism is unknown, Nocera thinks positively charged cobalt ions must pull electrons from the hydrogen atoms of water molecules, releasing oxygen in the process. Impressively, oxygen is formed at a rate rivalling that of photosynthesis. But according to Nocera, the most exciting thing about the catalyst is its ability to self-repair, which is analogous to that of the leaf. Although he says the advance is a good piece of science, Turner argues that plenty of good oxygen evolving catalysts already exist that don’t use precious metals. And in any case, he adds, the light absorbing material that scientists eventually find may not work in neutral solution.